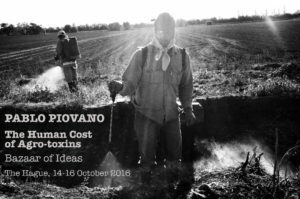 The inauguration of the People’s Assemby of The Hague 2016, which will take place at the Bazaar of Ideas on October 14th, will also host the “Human Cost of Agrotoxins” photographic exhibition by Argentinean photographer Pablo Ernesto Piovano. Pablo Piovano was born in Buenos Aires on September 7, 1981. He has been a staff photographer for the Pagina/12 newspaper in Argentina since he was 18 years old. In 2005 and 2014, he received scholarships from the Garcia Marquez Foundation. During 2001, he documented the tragic events occurred during the social and political crisis in Argentina, and in 2002, he published the book Episodios Argentinos, Diciembre y Despues. From 2004 to 2008, he coordinated a photography workshop for children and teenagers at risk at Isla Maciel neighborhood in the City of Buenos Aires. Since 2006 until the present, Piovano has exhibited every year at the Palais de Glace at the ARGRA (Photojournalists Association of Argentina) Annual Exhibition. In 2014, he presented an individual exhibition, “Portraits 2004-2014” at the Documentary Photography Biennale of Tucuman, featuring portraits of many influential figures in the country’s politics and culture. El costo humano de los agrotóxicos – por Pablo Ernesto Piovano (Subtitulado: inglés) from Pablo Ernesto Piovano on Vimeo.